After a UPS screw up, we finally left King Harbor at 1pm and motored out into Santa Monica Bay. The wind was very light and we continued motoring for about one hour. Then the wind picked up and we hoisted the sails. 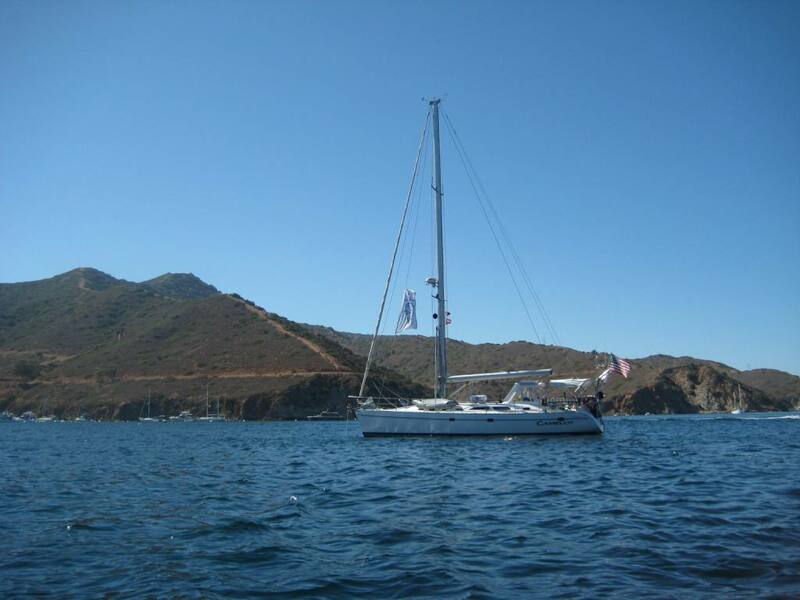 The wind was from the west at about 12 knots and it was perfect for sailing to Catalina. During the trip we saw speeds of up to 8.4 knots (10 mph) through the water, with winds gusting to 15 knots and the temp at about 75 degrees. Large groups of dolphins danced around the boat as we sailed. We haven’t seen such perfect sailing weather in a very long time. We arrived at Isthmus Cove (Two Harbors) at 4:30 pm covering just over 26 NM. The Harbor Master met us as we approached and assigned us the same mooring we had two years ago. We have a great view and nice neighbors. So now we are secure and getting ready for dinner. We spent two days on a mooring and then decided we were not ready to leave, so we moved off the mooring and are now anchored just outside Isthmus Cove. The weather has turned hot and we are loving it. On Tuesday, after two nights of rolling waves, we decided to move off the anchor back into Isthmus Cove moorings. The weather changed to cloudy skies, warm and really humid. After dark we got a big suprise, a weather squall moved through the Isthmus and created 40+ mph winds for about 10 minutes, followed by a light rain. This was amplified by the Isthmus, which funels the wind from one side of the island to the other. We did the weather dance and ran around the boat getting everything tied down and stowed the bimini. We ended up fine with no damage, but a neighboring 49′ sailboat dragged its mooring over 15 feet and collided with another boat. Wednesday morning the sunrise was beautiful. I tried to capture it with a photo, but this doesn’t even begin to do it justice. Good to hear you are working your way south, and looking forward to meeting up with you! We are hauled in Ventura for a few projects and repairs, a bit longer than expected, but hoping to be out of here by midweek then off to the Channel Islands. 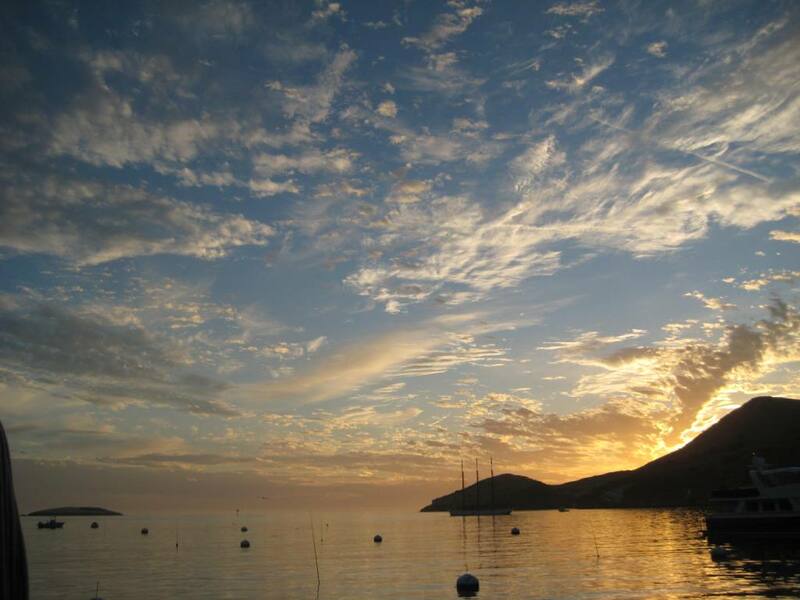 After that we’ll be following your wake – to King Harbor, then Catalina. WOW I’m so jealous and happy for you two. How is everything working on the boat? Just wanted to say hi from San Francisco and will keep in touch. You’re in “Two Harbors” at once? We now have proof of a parallel universe. Happy sailing. catalina is beautiful and the wildlife is awesome on the downward leg. we miss you. sandy sends her love. I have heard your check ins twice now on the Maritime Net @ 14.300 – headed for Santa Cruz and headed for Catalina. I could not hear you directly – think your still too close. Try the 14.300 Pacific Seafarers at 8:30 PM – how I contacted Russ & Roz Worall in Bora Bora. As you know we are in the Isthmus Cove. Will listen on the 14300 net or we can go to 8 meters. We just wanted to let you know that the folks at Berkeley Humane and Animal Control are (enviously) following your progress. I read your blog aloud to Squirrel and Madu who pretend to ignore me. As usual, chaos reigns in Berkeley. Sail on and keep us up on your adventures!